ADEPT Plumbing and Gas Carry a wide range of hot water system spare parts from thermostats, elements, tempering valves, relief and expansion control valves for resistance electrical hot water services to diaphrams for Vallient pyrox gas hot water and control boards and hydro generators for Bosch hydro units. So there is minimal down time or trips to supliers when you call ADEPT Plumbing and Gas to repair your hot water unit. ADEPT Plumbing and Gas holds a restricted electrical license. 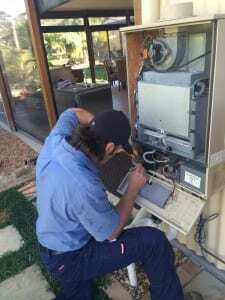 So a trained professional can carry out element and thermostat replacement in a safe manner. When the hot water service is beyond economic repair then ADEPT Plumbing and Gas can provide you with a competitive price to replace your old unit with one that will serve your current hot water needs within your budget.